I am way too lazy to write anything up for this right now. 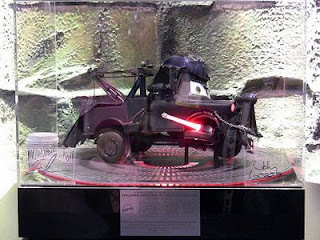 So, click here and look at some photos of Darth Mater. Maybe later I will write something up. 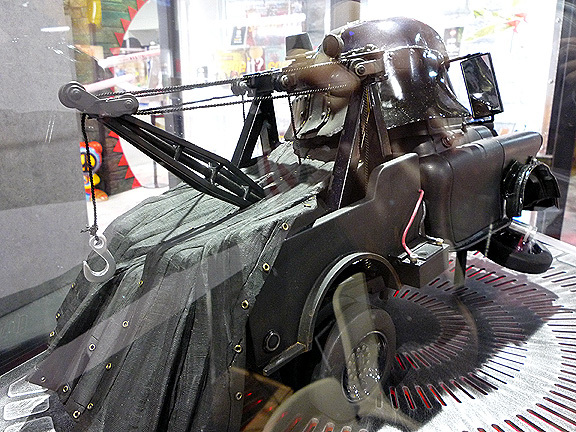 UPDATE: At Comic-Con, some people were asking me what I actually did on Darth Mater. I did 90% of the sculpting of Darth Mater. Joe Sid (who is listed on the plaque) sculpted the cape. The Mater you see underneath was first sculpted by me in 2004 and was made for the Cars toy line that you may see in the stores today. This was done from scratch in the computer using a program called Freeform and using reference photos provided by Pixar. 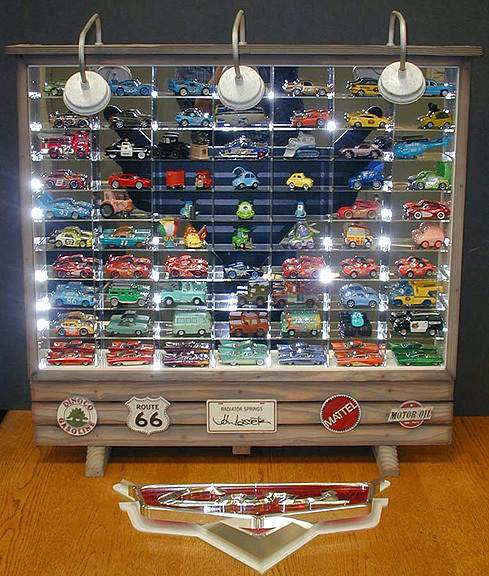 I was also part of the license pitch that brought the Cars license to Mattel. Anyway, in 2-3 weeks time, I sculpted Mater and it was approved by Pixar...fast forward to 2005, the movie and toys come out. Both are successful, and made/is still making tons of money for both companies. ...there. Now, I did nothing on this one. Well, actually, like I said I did sculpt Mater, as well as, Lightning McQueen, and The King. So, those are in there a few times in different variations. For this year's Dream Halloween, they wanted something big. Ben at Pixar came up with the idea of "Darth Mater". Gentle Giant did a few sketches and Pixar decided on the concept and I was tasked to sculpt it. Since I already had the Mater file, all I had to do was the Darth parts. The other pictures on that site are not that great due to poor lighting at Comic-Con. Brandon did a wonderful job. There are traces of 'rust' and 'different metals'. He really made my sculpt look ten times better. The rest was done by a bunch of people at Mattel. The pieces were printed by our Rapid Prototype Group, Perry and Bobby. Clean up of the 28 pieces were done by our shop guys. Sorry, I do not know who in the shop worked on it, but they are listed as Mattel Model Shop on the plaque. The plaques and base were made by Jim and Rex in the shop. Assembly of parts by Hank,Mike, and James (listed on plaque), this includes fitting pieces together, installing lights, installing motor, and making it move. Our Electronics Group and Sound Lab (again, I apologize, I do not know the individuals who worked on this) did the electronics, including lights, sound, movement programming. Yeah, that is about it. In all, I estimate about thirty people had their hands on this. When Dream Halloween comes around, I will update with photos and winning bid. Yesterday, I was at the San Diego Comic Con. Total geek fest...which is why I was there. One of the pieces I made was there, but I failed to take a photo of it. When you work on something for about a month, you kinda get sick of it. Anyway, it is "Darth Mater". 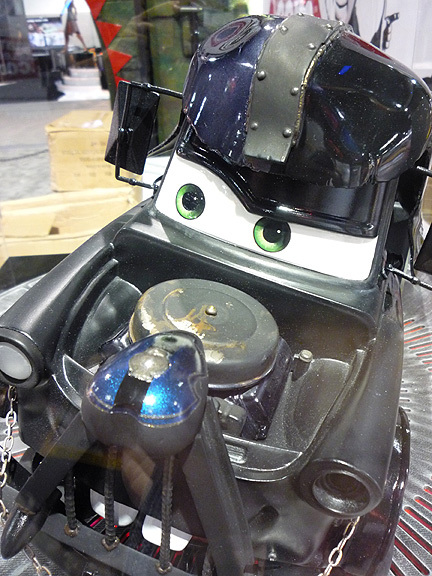 Mater for Pixar's CARS dressed up as Darth Vader. I worked with Pixar on the project, that is how I got to visit Pixar. The adventure began with a five hour bus ride to San Diego from El Segundo. "But it is only a two hour drive", you say? Well, no one factored in a semi truck hitting a van parked on the shoulder, flipping over, and having its gas tank explode, then setting the near by hill on fire...causing a three hour delay. At one point we traveled four miles in one hour. Awesome! Anyway, we got there. I did the usual looking around, and I found my buddy Snoopy. I spent the entire time there looking for J. Scott Campbell. I finally found his booth with about a half hour to spare. He signed my book and poster...$50, but worth it. This guy is amazing! I also met up with an old school mate. She works in Rhode Island at Hasbro on the Littlest Pet Shop line. She spotted me and we hung out for a few hours. That was awesome. It is great to see old friends, email and Facebook just is not the same. I wish I could have spent more time with her. Who knows when I will see her again. Oh, yeah...I also saw Kevin Spacey there. He had a whole "security team" with him and a camera crew. He came within three feet of me. I did not realize until the chubby security guard pushed me out of the way as if there was a fire. Nothing against Mr. Spacey, I think he is a great actor...but most security people are a bunch of ASSHOLES!